World News' Diane Sawyer on Wednesday hailed a questionably legal recess appointment by Barack Obama, praising the incoming arrival of a "consumer champion" who will "help" Americans with their financial problems. The program offered no skepticism as to whether a new, unrestrained bureau could harm businesses in America. Sawyer teased the program, "Consumer champion. Can this brand new man in town help you with your mortgage, your car loan, your credit cards?" [MP3 audio here.] Instead of any questions about the bureau, reporter Cecila Vega featured Pamela Banks of the Consumer Union, a group that supported the recess appointment of Richard Cordray. The journalist did explain that "some" find Cordray's appointment by Obama, at a time when the Senate isn't technically in recess, to be an example of "down-right arrogance." She added that Republicans call it an "unprecedented power grab." Thursday's "Good Morning America" skipped the controversy entirely. Over on CBS, Wednesday's "Evening News" ignored the story, too. However, Bill Plante on Thurday's "Early Show," informed, "It was an unprecedented and deliberately provocative act. The President thumbed his nose at the Senate Republicans and he made a recess appointment of Richard Cordray to head the new Consumer Protection Agency." Of all the morning shows and evening newscasts, only Plante made this point about the Senate's habit of technically being in session during holiday breaks: "The practice was started in 2005 by a Democrat, Majority leader Harry Reid, to block appointments by President Bush." "Nightly News" anchor Brian Williams on Wednesday offered pressing details, but only in a quick news brief. He noted that Senate Republicans "argue this appointment is illegal " and that "the courts will probably have the last word on this." Wouldn't such a story be worth more than a few seconds? The "Today" show on Thursday allowed a single news brief during the show's four hours of air time. DIANE SAWYER: Consumer champion. Can this brand new man in town help you with your mortgage, your car loan, your credit cards? 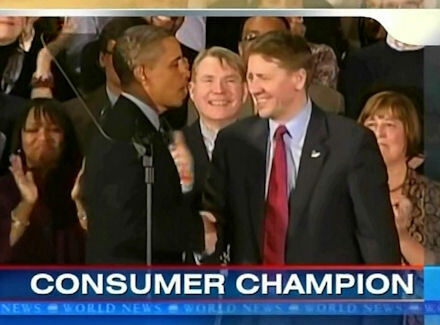 SAWYER: As the Republicans turned up the heat, President Obama pulled off a kind of political end run in Congress today, installing former Ohio Attorney General Richard Cordray as the head of the powerful new Consumer Financial Protection Bureau. A move that sent a jolt among Republicans. And ABC's Cecilia Vega has more on that. Cecilia? 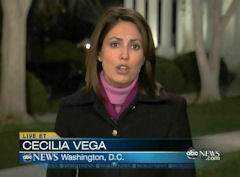 CECILA VEGA: Good evening, Diane. And those consumer groups are hoping one of the very first things Richard Cordray does is tackle this, the credit card application form. We have all seen them. We have all had our eyes glaze over them. That minuscule print, that incomprehensible language. This new agency could change all that and put it all in plain old English. The Eason's [PH] nearly lost their Ohio home to a predatory mortgage lender who offered to make repairs on their old house, but fled, leaving them in $80,000 in debt. With President Obama and the new consumer watchdog czar at their dining room table today, they became the poster family for everything the new agency plans to change. Harassment by debt collectors? Gone. Sky-high fees on supposedly free checking account accounts? Gone. And an endless paper trail of mortgage documents? Gone? What do they see right now? PAMELA BANKS (Consumer Union): Well, in the mortgage area right now, what they see is a lot of gobbledygook and reams of paper of things they have to review. VEGA: But, to get Richard Cordray at the helm, President Obama had to go around Congress. In a blatant act of defiance, some call it down-right arrogance, the President a appointed a man blocked by the Senate for months, on a day when the Senate halls were empty for the holiday break. BARACK OBAMA: Now is the time to do everything we can to protect consumers, prevent financial crisis like the one we've been through from ever happening again. That starts with letting Richard do his job. VEGA: Republicans call it an unprecedented power grab over an agency that lacks accountability. Too much authority in the hands of one man. And in a sign that this Washington showdown will go on, on his first day on the job, Cordray was called to testify before Congress. SENATOR MITCH MCCONNELL: If you ask me, the American people should be getting more transparency out of this administration, not less. VEGA: Now, McConnell and the Republicans say the Senate is actually in session and the President had no right to make this so-called recess appointment. The White House says that is all just a gimmick, that senators are not working right now. Diane, setting the stage out here for yet another fight in Washington. — Scott Whitlock is the senior news analyst for the Media Research Center. Click here to follow him on Twitter.